This report reviews recent theoretical, experimental, and modeling research on the environments and physical conditions encountered by Mars ejecta during certain processes. It recommends whether missions returning samples from Phobos and/or Deimos should be classified as "restricted" or "unrestricted" Earth return in the framework of the planetary protection policy maintained by COSPAR. This report also considers the specific ways the classification of sample return from Deimos is a different case than sample return from Phobos. 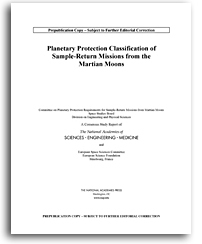 An international consensus policy to prevent the biological cross-contamination of planetary bodies exists and is maintained by the Committee on Space Research (COSPAR) of the International Council for Science, which is consultative to the United Nations Committee on the Peaceful Uses of Outer Space. Currently, COSPAR's planetary protection policy does not specify the status of sample-return missions from Phobos or Deimos, the moons of Mars. Although the moons themselves are not considered potential habitats for life or of intrinsic relevance to prebiotic chemical evolution, recent studies indicate that a significant amount of material recently ejected from Mars could be present on the surface of Phobos and, to a lesser extent, Deimos. This report reviews recent theoretical, experimental, and modeling research on the environments and physical conditions encountered by Mars ejecta during certain processes. It recommends whether missions returning samples from Phobos and/or Deimos should be classified as \"restricted\" or \"unrestricted\" Earth return in the framework of the planetary protection policy maintained by COSPAR. This report also considers the specific ways the classification of sample return from Deimos is a different case than sample return from Phobos.